This easy baked salmon fillet recipe with sour cream, lemon and dill will turn out flavorful and moist every time you cook it. Sharp lemon juice and sour cream enhance and lift the flavor of salmon. The dish makes a quick lunch or dinner and can be cooked in just 30 minutes. 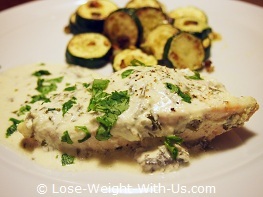 This oven baked salmon recipe works well with sauteed garlic zucchini. There are 313 calories and 6g of net carbs per portion. The recipe is suitable for a low carbohydrate high protein, low glycemic index and diabetic diet. Recipe Nutritional Profile: Diabetes Appropriate, Healthy Weight, Heart Healthy, High Protein, High Potassium, Low Calories, Low Carbs, Low GI, Low Sodium, Good Source of Vitamin A, Vitamin B-12, Vitamin B-6, Vitamin C, Niacin, Phosphorus, Selenium and Thiamin. 1 tsp. of fresh parsley leaves, chopped. Mix the sour cream with the lemon juice, dill, salt and pepper, and leave to one side. Wash the salmon fillets under cold running water then pat the fish dry and place into a small baking dish. Pour the lemon and dill cream over the salmon fillets and cook in the oven for 20 min. It will take approx. 10 min to saute zucchini, so start when the fish has been already cooked in the oven for 10 min. Heat a nonstick frying pan with 1 tbsp. of olive oil. When the oil is hot, throw in the zucchini slices with garlic and fry the zucchini on both sides until lightly golden in color, about 3-5 min on each side. Serve the salmon and zucchini hot on a warm plate, garnished with fresh parsley.